The BlackBerry Q10 is due to go on sale in the UK shortly, and now BlackBerry has announced on Twitter that the handset will go on sale exclusively this Friday at Selfridges. 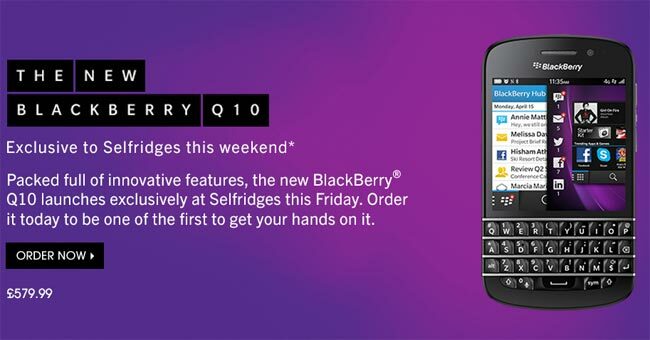 Selfridges will be offering the SIM free version of the BlackBerry Q10, and the handset will retail for £579.99 and will be availabe on Friday, Saturday and Sunday. The BlackBerry Q10 is BlackBerry’s first QWERTY BlackBerry 10 smartphone, and the device features a 3.1 inch AMOLED display which has a resolution of 720 x 720 pixels. Processing on the BlackBerry Q10 is provided by a dual core 1.5GHz processor and it comes with 16GB of built in storage and 2GB of RAM, there is also a microSD card slot that can take up to 64GB cards. Other specifications on the BlackBerry Q10 include a front facing 2 megapixel camera which features 3x digital zoom and it can record HD video in 720p, on the back of the Q10 is a full HD 8 megapixel camera that can record video in 1080p, this features 5x digital zoom.